Kalu Rinpoche (Tib. ཀར་ལུ་རིན་པོ་ཆེ་, Wyl. kar lu rin po che) or Karma Rangjung Kunkhyab (Tib. ཀརྨ་རང་བྱུང་ཀུན་ཁྱབ་, Wyl. ka.rma rang byung kun khyab) (1905-1989) was a prominent teacher of the Karma Kagyü and Shangpa Kagyü traditions, who taught extensively around the world, and established many Dharma centres in Europe and North America. He also initiated a project to translate Jamgön Kongtrul's Treasury of Knowledge into English. He was also Sogyal Rinpoche's uncle. In fact, Sogyal Rinpoche was delivered by Kalu Rinpoche's own brother, who was called Ratak Sogyal. Kalu Rinpoche was born in Trehor in Kham in 1905. His father, Karma Lekshé Drayang, the Thirteenth Ratak Palzang Tulku, was a respected doctor. He began his studies at the age of thirteen at Palpung Monastery, where Palpung Situ Rinpoche ordained him and gave him the name Karma Rangjung Kunkhyab. After two years of studying the sutras and tantras, and receiving instruction and empowerments from many of the great lamas at Palpung and other monasteries in Kham, he gave a teaching on the three sets of vows before an assembly of a hundred monks and lay people. Among his teachers was Jamyang Khyentse Chökyi Lodrö, to whom he also gave several empowerments and transmissions. He began a traditional three-year retreat at the age of thirteen under the direction of his root lama, Lama Norbu Döndrup, from whom he received all the transmissions of the Karma Kagyü and Shangpa Kagyü traditions. From the age of twenty-five, he practised for twelve years in solitary retreat in the mountains of Kham, wandering about without possessions, until he was requested by Situ Rinpoche to return and teach. He then became the director of three-year retreats at Palpung. It was around this time that he was recognized by the sixteenth Karmapa as the activity emanation of Jamgön Kongtrul Lodrö Tayé. Having left Tibet in the 1950s, Kalu Rinpoche first went to Bhutan, where he established two retreat centres and ordained 300 monks. In 1965 he established his own monastery at Sonada in Darjeeling, Samdrub Dhargye Ling, and established a three-year retreat centre there. In 1983 he gave the Rinchen Terdzö to the four regents of the Karmapa, as well as to thousands of lamas, monks, nuns and lay people. He passed away on 10th May 1989 at his monastery in Sonada, India. His reincarnation, Yangsi Kalu Rinpoche (b. 17 September 1990) was recognized by Tai Situ Rinpoche at Sonada in 1992 and formally enthroned as the holder of the Shangpa Kagyü and Dashang Kagyü lineages on 25 February 1993. ↑ Shamar Rinpoche, Tai Situ Rinpoche, Jamgon Kongtrul Rinpoche, and Gyaltsab Rinpoche. Dezhung Rinpoche, The Life of Kalu Rinpoche, in A Saint in Seattle (Boston: Wisdom Publications, 2003), Appendix I.
Sogyal Rinpoche, The Tibetan Book of Living and Dying, revised and updated edition, Harper San Francisco, 2002, page 271. 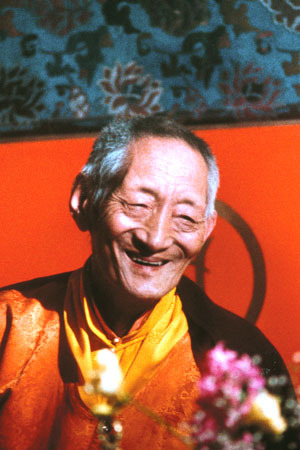 Khyentse Özer, (includes a teaching by Kalu Rinpoche on The Union of Mahamudra and Dzogchen), Rigpa, London, 1990. This page was last edited on 16 April 2018, at 23:54.